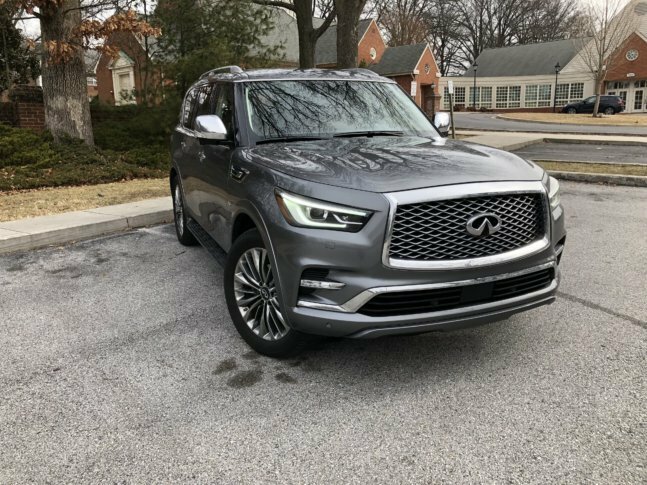 Large luxury SUVs seem to be as popular as ever and Infiniti offers a solid choice. The refreshed QX80 offers loads of technology and standout styling in a large, pleasant package that has room for the family to spread out and relax in style. WASHINGTON — Large luxury SUVs seem to be gaining popularity as buyers’ trade in pricey sedans for big SUVs. So where large SUVs might have seen sporadic updates, these rides are now seeing rapid updates to satisfy buyers moving from cars but expecting the latest tech and luxury in a much bigger package. The Infiniti QX80 is case in point. It’s been less than three short years since I looked at the then-all new QX80 and it has already had a host of updates. One of the biggest changes is the exterior styling, which I thought was a bit strange before. Infiniti changed the front end by adding larger headlight clusters that seem to better suited to this large vehicle. The new design gives a nice presence that looks fresh and sleek for such a big brute. It commands your attention with a large grill and huge 22-inch wheels with lower profile tires, a $2,800 option, which fills out the wheel wells. There is a good deal of chrome trim pieces on the body from emblems to the chrome-capped side view mirrors. Thankfully, the tall QX80 comes with running boards to help entry and exit but power-folding running boards would be nice. The inside of the Infiniti QX80 offers a plush environment with plenty of space. Spend $5,700 for the Deluxe Technology Package for the semi-aniline leather seats with heat and ventilation. There are only 10-way power adjustments for the driver, so it might be hard to find the perfect position for every driver. The fit and finish is very good with soft touch materials abound and nice leathers and woods. A lot of glass adds to a bright interior and you can see out very easily. The second row has captain’s chairs just like up front. There is even a center console with storage and cup holders. Dual screens are embedded in the front seat backs so passengers can watch a flick and relax on long rides. The third row is a bit of a hassle to get in and out of, but the space is very usable for the kids or an adult or two, although taller riders might find it tight. Storage through the power hatch is good but the lift up is pretty high. The NAV and audio system are easy to use, but the resolution doesn’t seem as crisp as some others in this class. When you hit the road in the QX80, you sit high up and would expect a truck-like ride. But I was pleasantly surprised that this is a quiet, mostly smooth ride. Only large bumps seem to be transmitted inside. The smaller standard wheels could help out with this. The wind noise I noticed on the previous QX80 has been hushed this time. The QX80 also handles pretty well for a large vehicle with the help of the optional Hydraulic Body Motion Control, which stops much of the lean-in corners and adds confidence behind the wheel. Power comes from a V8 with 400 horsepower that motivates the big Infiniti without fuss. The seven-speed automatic was very smooth, clicking off shifts sometimes without even knowing it. I probably don’t have to tell you that fuel economy for large SUVs like this one isn’t stellar. I did manage 14.8 mpg in 335 miles of driving. Infiniti has upped its safety technology too. Forward Emergency Braking with Pedestrian Detection measures distance from vehicles in front but also the speeds and warns and will brake if you don’t. The normal safety suite that you would expect in an $80,000 ride is present plus a cool LCD monitor for the normal rear view mirror. With the flip of a toggle on the mirror, you can see what’s behind you even when the back window is obscured.